In the Odyssey, Odysseus and his men run into giants twice. The first time they stop off on the island of the Cyclops, and this story is always referred to. The lesser told tale is of the Laestrygonians. In the story, most of his ships sail into a harbor that was surrounded by tall cliffs, thus providing a unique protected area. Among his many phobias Odysseus had a fear of enclosed places. It could be called claustrophobia, except the harbor was quite large. A whole fleet could fit in there. It was more the fact that Odysseus had an uncanny ability to survive. In the epic, his men are portrayed as over-eager and greedy. And once again they hastened to get off their boats and take a look around, devouring what provisions they could find. The truth was that Odysseus and his officers ate well and slept on mattresses that were dried daily. The rest of the crew made do with moldy bread, rancid meat, and brackish water. Also, as I mentioned earlier, they were goat herders and farmers, who never could get used to sleeping on deck in rolling waters. Any excuse to feel the earth beneath their feet, get some fresh food and water, and they took it. Yes, the cliffs were a a little intimidating, but they craved land. It was their undoing since a tribe of giants lived on the island and waited for such opportunities, to throw rocks off the cliffs and target ships for sport and spear men for food. Odysseus, his ship safely outside the harbor, once again sailed off unscathed, out of the shadows of those giants and the cries of his men. The only giants we faced were the awesome giant forests of redwoods. 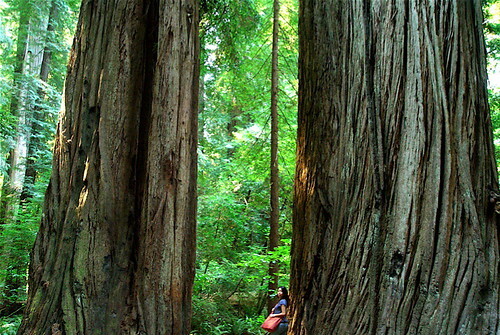 Redwoods are the tallest trees in the world. Their trunks grow so massive that tunnels have been carved through them so roads could pass and thus attract tourists. Groves of trees thousands of years old still exist. The secret of their success is the spongy bark that repels fire because of the moisture it holds and wards off pests because of the tannins it produces. Less than 5% of the original old-growth forests still exist. The rest of the redwood range which only grows along the Northern California coast, is filled with younger trees. Not so surprisingly, greedy logging companies still want to cut the rest of the these down but most are now protected. We spent several nights in Crescent City, a ramshackle coastal city, near many state parks and national forests and parks. The biggest trees we saw had massive trunks that could easily encompass our Tokyo apartment. The best was a trail called Boy Scout Trail in the Jedediah Smith State Park. There were almost no people and you could fully appreciate the eerie silence, another advantage of the spongy bark which act as sound proofing. In the groves of these giants, you can feel the fairies, sprites and other wood spirits watching you through the fog. Wind, I love how you managed to bring together two of my favorite subjects in this post: Greek mythology and trees. 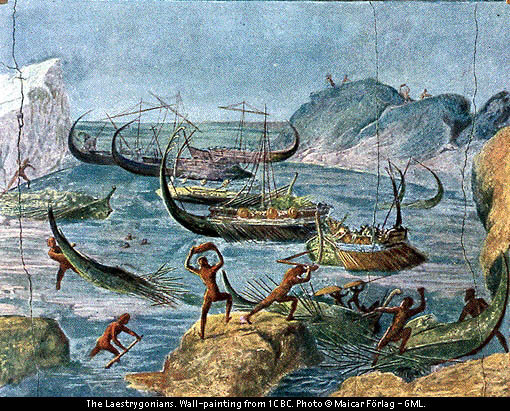 I read the Odyssey many years ago and had almost forgotten all about the Laestrygonians. I didn’t know about the sound proofing created by the spongy bark of the redwoods. I’ve never been to California but I did live in British Columbia for a few years. The forests there were magical. there’s something extra magical about redwood forests. not only are the trees huge, but the fact that they’re an ancient species also gives them a presence. as a tree and nature lover, you would love them. Nice park. I was in Jedediah Smith redwood last week again. “Ramshackle” is a fitting description of part of Crescent City, although I’d say its luxurious compared to Orick, about 40 miles to the south. If you liked that redwood adventure, click my name for my redwood page. You might find a few trees to your liking.